Thanks to Cara B Anderson for the photo. Not all canvas 'for artists' is actually any good. Here's my notes from educating myself, written up into a readable form. 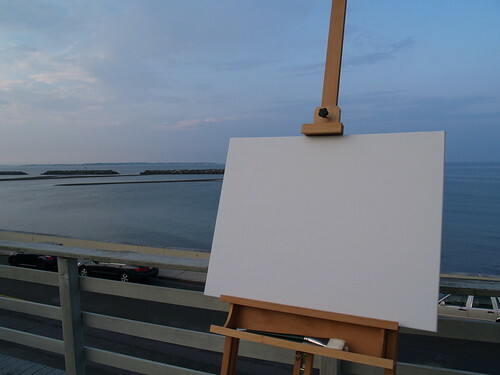 Canvas for artists is generally available in three forms. Stretched (and primed), unstretched and primed and unstretched and unprimed. Naturally the form that saves an artist the most time is also the most expensive as all the preparation work has been done. I am talking here about the prestretched and preprimed canvases. There is nothing to do but take any wrapping off and get to being creative. This is a time saver that is not to be underestimated. The down side of ready to go canvas is that you have to take what's on offer. Which is not necessarily so bad. However, if you are after a non standard size or are particular about the weight of canvas on which you work or fussy about the gesso used and the surface finish you like to paint on, then the small number of options of prestretched canvas will probably drive you nuts. So on to unstretched canvas. This is usually priced per length from a roll and cut when you buy. There is a lot more choice with this form of canvas, but some preparation work before painting. Unstretched canvas does not have to be stretched onto a frame, but that is the conventional way. It is perfectly possible to work on canvas as you do a piece of paper. The stretching is to give a nice flat and smooth surface to paint on. Most painters like the bounce or give in a canvas stretched on a frame. I'm not going to give a how to on stretching canvas right here, but just say that if you buy canvas off a roll, you are more than likely going to stretch it onto a frame yourself. That takes time, of course. But you can make the frame any crazy size you want. Canvas bought from a roll comes in two forms. Primed and unprimed. Primed means that once you've managed the stretching, you can get right to painting. Probably a good choice for an unusual sized frame where you're not too fussy about the gesso primer and the finish of the surface you paint on. Although it is certainly possible to reprime and/or sand a preprimed canvas to your heart's content. The most labour intensive, for the artist, is to use unprimed unstretched canvas. Here you will be both stretching and priming your painting surface. If you are super particular about your painting surface, this one's for you. Though be warned, you will spend about half your 'painting time' in stretching and priming. But you will be able to get *exactly* what you want. That was meant to be a quick rundown on the forms that art canvas comes in. There is also variation in the actual canvas itself. Jute or hessian is dirt cheap, has a very rough and open weaved texture and quickly weakens and becomes brittle with age. Not recommended for longevity! But what a texture. There are synthetic canvases usually made from polyester. Photo or giclee printing onto canvas tends to use synthetic canvases. They tend to have a much more even, tight weave which lacks character. Or bestows supreme consistency, depending on your taste. They are said (by the manufacturers) to stand up much better than cotton and linen when exposed to the elements and to be immune to bacteria, mildew and air pollution. Professional art supply stores call synthetic canvas 'cheap' (which is quite an advantage, I think) and tend to take a sneering tone toward it. I have not managed to turn up any unbiased information on it's artistic archival properties (ie, how it reacts over time to gesso and paint), however the tent and boating industries sing the praises of synthetic canvas, citing it's longevity over traditional cotton canvas. And if it performs in those tough environments, the omens seem good to me. One to watch. On blended yarns: "Blends of fibre (ie cotton/polyster or cotton/linen) should be avoided as the final product is usually unstable due to the different weights, strengths and characteristics of the two yarns. They are only suitable if the blend is in the thread, and exists in equal weight ratio in the warp and weft." Thanks. This is the one to go for if you are buying cotton canvas. It is more tightly woven than plain canvas. Cotton canvas is the most conventional surface for painting (oils and acrylics obviously). It's properties are well known and it's available everywhere. It is flexible, easy to stretch properly and not too expensive. For large paintings it is too flexible. Large being over a metre square. From the flax plant. Belgian is considered the best. If you are after absolute quality, this is the type of canvas to go for. Although linen is difficult to prime and stretch properly, it has the best archival properties. Because it has less flexibility than cotton, it expands and contracts less with changes in temperature and humidity. This means the paint on top has a much more stable surface and is far less likely to crack. And it's strong and stiff enough to support large paintings (over 1m square). Cotton fibres are short and flat (only 4 to 5cm long) whereas linen fibres are round and can range from 25 to 90cm in length. Many painters also like the uneven, natural texture of linen. Oh, and by the way, it's brown. Just to be clear here, I'm talking about cotton and linen. The synthetic canvases are much stronger per weight, so these figures don't apply. 7-8 oz. Beware! Not good enough for long lasting art. Often used for prestretched canvases. Usually poor quality loose weave and not very stable or strong. Avoid. 10 oz. The world's most popular art canvas weight. Fine for small artworks or situations where there will be little strain on the canvas. The main thing to watch out for is that most cotton canvas of this weight is twice as strong in one direction than the other (2:1 weave). Which reduces its dimensional stability. Warp and weft threads should be of equal weight, strength and material. The ideal yarn is closely and tightly woven with a square (1:1 or 2:2) weave. 12-15 oz. The best weight for painting. Nice and strong. Now you know. (And when I say cheap - they all seem to cost a fair bit to me - but these I can afford.) People say I shouldn't but don't have really good reasons... they just seem a little snobby toward them. I had a look to find the weight - not mentioned on my packaging unfortunately. Nice to read some clear thoughs on it all! Thanks! I found your blog post by googling for canvas buying tips. Yours are very well written and informative.